What is Alpha Juno Contol? Great question, glad you asked. :) Well, for the five years that I've owned my Alpha Juno, I've loved the sounds it produces but have always detested its editting method. I mean, the LED display is nice and all, but using the Alpha Dial to get everywhere just drove me nuts. So I coded Alpha Juno Control. 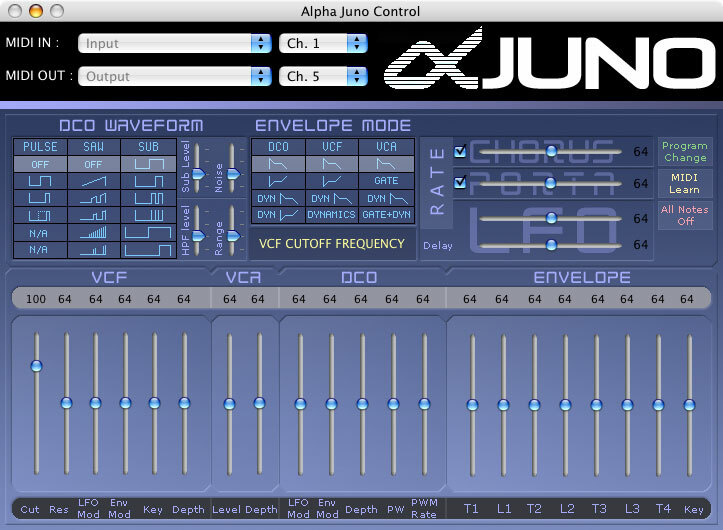 In short, Alpha Juno Control is a small utility app that will let owners of Roland's Alpha Juno keyboard control patch parameters via MIDI from their beloved Mac's (OS X). Now save this setting: Press and hold WRITE, then press MIDI again. There are many new features but the coolest feature is the ability to map incoming control changes (CC messages) to the onscreen sliders. Posted by batwings on Sat, 04/07/2012 - 01:24. Posted by Most Significant Bit on Tue, 03/15/2011 - 02:56. YES thank you holy bejeezus it's free too. Posted by Chris Nova on Sun, 01/18/2009 - 02:40.
untill i power off and on the synth..
Posted by Andy on Thu, 01/08/2009 - 17:36. My Alpha Juno 1 does not receive parameter settings I change in Alpha Juno Control. Program Change works fine, Midi EXCL is ON on my Juno. Midi Monitor shows that Alpha Juno Control is sending SysEx messages to the correct midi port. I am also able to send and receive SysEx messages with SysEx Librarian.app. Anyone has an idea what could be wrong? Posted by David thomas on Thu, 11/15/2007 - 13:59.